Scoutmaster Musings - Appropriate Art? After my hike last weekend, I'm pondering something. 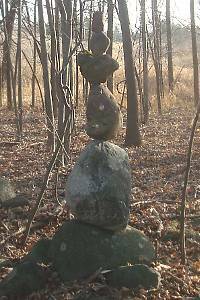 I found this, and a few more, balancing rock formations that someone created along the trail. I think they look pretty neat and I've seen them done as art before. The quandry comes from the location of this person's efforts. It is in a state park and along a well-trafficked trail. Most people come here, I believe, to walk through the woods and enjoy the natural beauty around them. None are expecting man-made artistic structures along the trail. So my perceived dilemma is, should I admire the rock pile and leave it as I continue my hike, or should I take off each rock and toss it out into the woods? The first response recognizes the efforts of the person and leaves the art for others to enjoy because it really does look pretty cool. The second puts more importance on the natural beauty and feeling that the wilds are unspoiled, and also supporting the minimal impact and leave no trace ethics. If I were to encounter this in a wild area, my choice would easily be made to dismantle the structure. In my view, the wilds should remain as natural and wild as possible and man-made impacts should be removed. But, this was along a frontcountry trail where folks hike for an hour or so and there are rest benches, toilets, water fountains, and picnic tables in the area. For all I know, it's possible this art was approved by the land manager to make the trail more interesting. After all, lots of other people have walked past them and left them there. In this case, I left them alone but have sent an email to the Department of Natural Resources contact to ask what they would prefer to have done with them. Whatever the response (I'll let you know), I do hope we all agree that it is not our place to create artistic sculptures, structures, drawings, or whatnot out in the public wild places. Minimizing our impact and allowing future visitors to experience as wild and natural a place as we enjoyed is our duty. Would you have taken the rock piles apart or left them for others to enjoy?